Facebook is the new Google when it comes to searching for friends or acquaintances. The social media giant is one of the most powerful searching tools. However, not many of its users are aware of all the hidden search functions within it. We decided to walk you through many of such features that are available for Facebook. With these cool functions, finding people would become even easier for you. Well, this is the easy one. We all hit the search bar in Facebook and type our friend’s name to connect with them. But when typing the name, make sure you keep an eye on the suggestions given on the right side of the page. Facebook search offers suggestions based on mutual friends, friends of friends, organisations, and even common groups. The suggestions tab works just well in most of the cases. However, what about the ones who are complete strangers? Or someone you met on a train journey with no mutual friends? There you go, if you have their e-mail address or phone number then type it in the search bar. 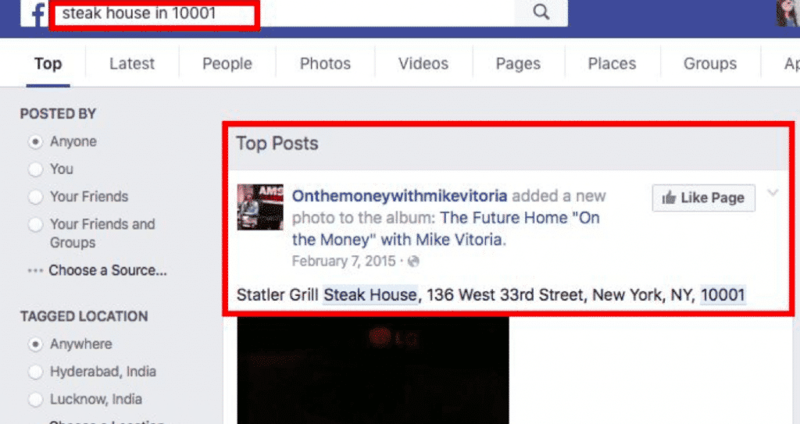 Facebook will then fetch most relevant results for you. You can test this search feature by typing in your own e-mail address or phone number. For phone numbers, there is a slight challenge, as not all of the Facebook users register their numbers in the profile info section and e-mail addresses are also sometimes different. So what if they’ve made the profile using a different e-mail address? For all these shortcomings, there is another way out. The Solution – It is something that I’ve tested over a long period of time and got great results. Simply hit the search bar and type the first name along with any information that you have, such as their school name, college name, workplace’s name. For Example – Daniel TrendBlog – this would fetch you the profile of our well-known TrendBlog writer, Daniel Bulygin. That was just for the reference; we don’t want Daniel to receive an avalanche of requests. So you came across an interesting post the other day but couldn’t find it today? Don’t worry, here is what you can do about it. All you’ve got to do is type a few keywords in the search bar. Facebook’s graph search can come in handy in such situations. For example, if it was a hilarious post about Donald Trump. To search for that post, just type “Donald Trump” in the search bar. 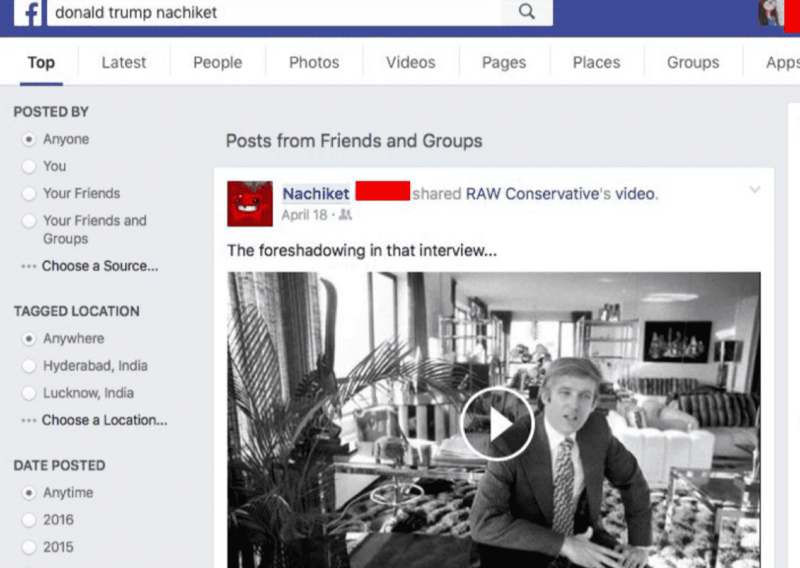 Facebook search would return with trending posts and recent posts about Donald Trump. Yes, there is an easy way to refresh your memory. The activity log on Facebook stores every activity of yours such as commenting on a post, liking a post, sharing, and much more. Activity log also keeps track of your Facebook search history. In case you are looking for a particular activity, then you can type relevant for relevant keywords in the search bar given on the top right corner of the log. But this search is not as effective as Facebook graph search. You want to go to this new outlet or place in your town but don’t know whether it is good or not? Well, simply type the name of that place in the search bar and the results will show you pictures, comments, reviews, check-ins of the people who have visited the place. Also, you can search for new hangouts through the search bar on Facebook. Err, but sometimes even locations get mixed up as places have common names around the world. So it’s better to search for places by using the ZIP code of that area. The code will fetch you relevant results. For example – “steak house in 10001” this keyword will show all the trending steak houses in New York City. Similarly, you can search for famous locations around the world. 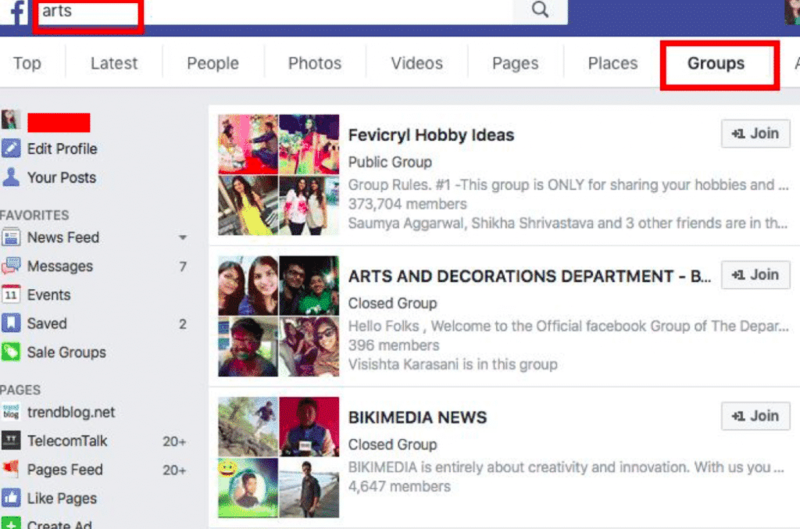 Finding groups on Facebook seems like an easy task, but what about the hidden or closed groups? So, here is a solution. Simply type the keyword for the group you are looking for and then select the group tab from the search results. By selecting the group tab – you will come across a filtered list of groups. It will also help you in joining new groups according to your interests. To conclude, we would say that most of the search results heavily depend on upon the privacy settings of your friends on Facebook. In case they’ve put up high privacy settings on Facebook, then their posts might not show up in the search results. Overall, we found these search functions pretty useful. Did you know about these functions? Have we missed any feature? Share your views through the comment section below.